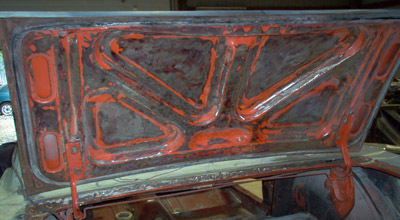 Trunk Rust Repair and Restoration is almost as common as floor pan repair or replacement. I got off lucky with this project. Most of the rust in the trunk area was just surface rust, save for a small area in the gas tank support flange that will need a patch welded in. The surface rust, however left a number of areas looking shabby, with a pitted surface, which wouldn't look good if left alone. As well, the previous owner had started removing paint with a grinder in the trunk area and left an extremely uneven surface to work with. So, I decided to treat the entire trunk area to a rough area cleanup, and finish off with a skim coat, before undercoating and painting. After removing the surface rust and roughing up the area, I covered the area with a layer of short strand fiberglass filler. This fiberglass filler not only fills the minor imperfections, it also helps to water proof the floor panels. Once this has been sanded, I'll treat it to a skim coat with my lightweight filler and then prep it for priming and finishing. 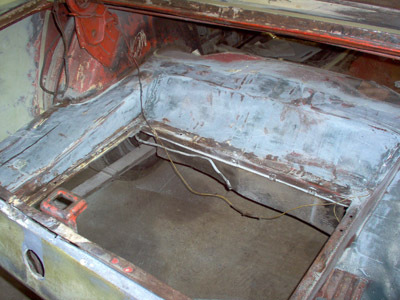 Trunk floor Replacement is not in the cards for my 65 Mustang, but if you're interested in learning how to replace a trunk floor, don't worry. When this car is done, my next Mustang project, having spent too many years spent sitting outside in high humidity, will be getting an entire trunk floor pan replacement. The 1965 Mustang trunk lid is in decent shape, requiring no rust repair, however, 45 years of fun and games has left it's share of dings and wear. And the previous owner and his grinder or abrasive wheel has left me with a job here too, to smooth out his restoration "work" before priming and painting. If you plan to go the Concours route, be prepared to spend a lot of time with the details, or buying lots of new metal parts. But as I mentioned before, even new panels usually are not perfect. They do, however make for a faster but more costly repair. Trunk rust repair may also include work on your trunk lid. My advise is, if it's minor, repair it, but if it's extensive, get a new or used trunk lid. Trunk rust repair may also include working on your trunk lid to get it in top shape. My advise is, if it's minor, repair it, but if it's extensive, get a new or used trunk lid.